My previous YouTube recommendation post was a HUGE hit, which was a bit of a surprise. The theme was picked up on by Kirsty who is also sharing her fab five each month now. It's always intriguing to see what type of content other people watch, whether they actually subscribe to receive regular updates from one particular content creator and how much time they spend watching their chosen content. 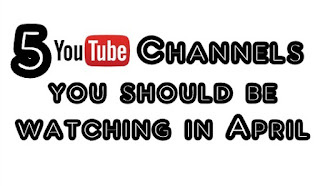 It's also interesting to see how YouTube take your viewing history and recommend more videos for you to watch. I've tried it with a few themes and the endorsed content is always from highly-subscribed channels and/or videos that already have a huge number of views - especially where they are all connected to a specific 'keyword' (i.e. What's In My Bag, The Best Friend Tag, My Boyfriend Does My Make-Up... meh). Where is the support for the channels looking to grow or those that cannot seem to break through this type of crap? Leading on from this, there is a fascinating realisation from a handful of highly-subscribed channel owners that regular content is becoming static and there are fluctuating trends for certain styles. I don't know what the fix is - or if, indeed, there is one. It feels as though more people are producing video content these days and expecting to make an income from it. I truly believe that, just like in television or film, there are a few people who are engaging and know how to retain audience attention and there are others who don't. 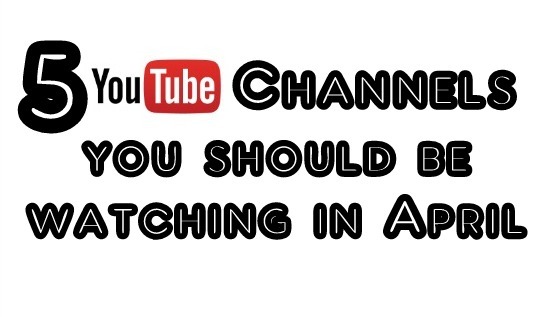 So, on that note, here are the five YouTube channels I think you should be watching in April. There's parkour and urban climbing and then there's James Kingston. His style of video production and communication with his audience has improved dramatically over the past 12 months or so and it's one of the best uses of a GoPro on YouTube at the moment. When I picked up a ukulele for the first time last year, this was the first channel that can up in a search when I was looking for instructions on how to play a certain song. The Ukulele Teacher makes learning really easy with demonstrations and annotations and I love that he's not the best singer (I hope he doesn't mind me saying that...) but has a go anyway! Dominique Sachse is a newscaster from Houston, Texas and shares a lot of lifestyle tips for women who are a similar age to her. She's obviously learnt a lot from the professional studio stylists over the years and is extremely adept at styling her own hair and make-up application. There's also some great advice videos on topics such as public speaking, fitness and looking good in photographs. There were a few shocked faces last month when I didn't recommend Dr Pimple Popper but I thought it was a bit too obvious, what with my obsession with cysts! Anyway, due to popular demand, here is the best channel out there for all things filled with pus - no dodgy camerawork and profession-led explanations about the procedures. I still wish I hadn't bottled it when I had my pyogenic granuloma removed last month - I really should have filmed the whole operation! It's time to recommend me some new content to watch. I don't care what it is but it should be something that really engages you and, as I said last month, the more random, the better!